Interested In Buying A “For Sale By Owner” Property? Let us help you understand the legalities of the documents. Purchase Agreements are binding contracts, and you should be comfortable with all the terms and negotiation options BEFORE you sign. Make sure you’ve reviewed and are acceptable to the information reported on the Seller’s Disclosure Form. Tell your Lender and Seller you’d like to close with us at ChoiceTitle! 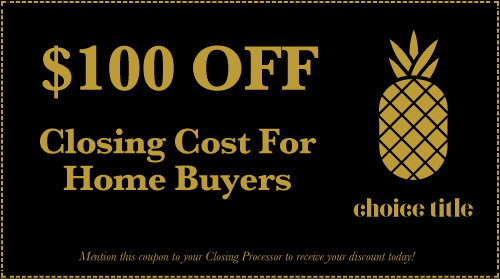 Buyers AND Sellers each save $100 on fees when closing with us! Or feel free to contact Mitzi at Mitzi@choicetitle.com or 985.603.0919 to discuss any questions you may have. We look forward to working with you!